I’ll admit I get excited everytime I hear a delivery truck go by followed shortly by a doorbell ring… but yesterday I was more excited than normal. All because my new Stampin’ Trimmer was set to arrive and after 5 months of anticipation, I finally got to play with one on my craft table! I decided to shoot a quick video after the kids went to bed to show you all the cool features but since I know that I’m not going to be able to get it all edited in time for this blog post, I figured I’d write up my review and give you a few pictures and then try to post my video for you by tomorrow. Between the two, I should cover all the new and improved features that make it something that I was excited about. Its true; the feature I was most excited about was actually just the fact that you get a wider platform without having to extend the arm of the cutter for additional cutting measurements. So, whereas before I could easily cut a card base that was 4 1/4” x 11”, if I wanted to cut 5 1/2” x 8 1/2”, that required me to clear off more space on my table and extend the side arm. And heaven help me if I needed to cut something at 5 1/4” or 5”… I got good at getting close, but it was always a bit of a guess. See, it totally fits! With room to spare even! How much room? You get 6 1/4 inches wide to play with and over 12 inches long. 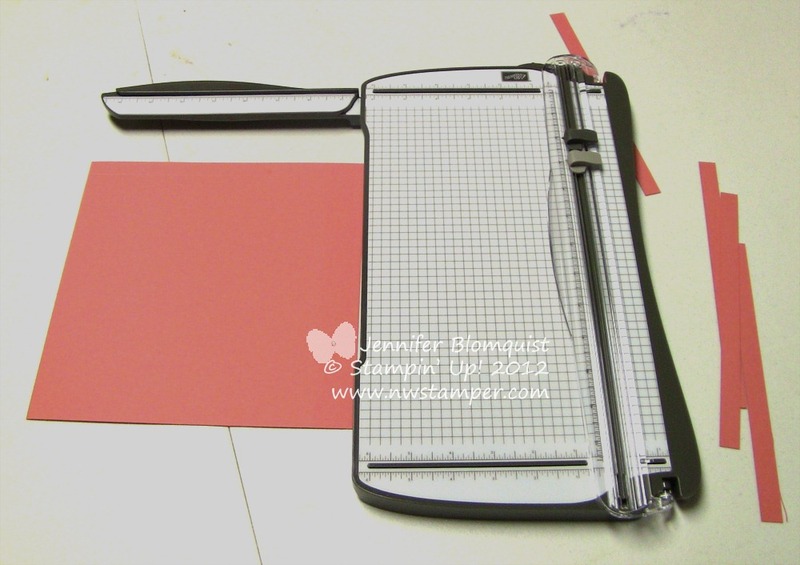 So, if you are a card maker or do 6×6 scrapbook pages, you are golden with the trimmer as is. And it still feels pretty compact too. I would happily put this in my table top tote and bring it with me to a crop or scrapping retreat. So, if I’m going to be honest, I’m pretty happy with how they did the surface measurements on the trimmer. I love how the gridlines and numbers are UNDER a laminated surface, so they won’t rub off over time! I never had that happen with my old trimmer but I know enough people who had problems with their little Fiskars cutter doing this that I’m very happy about this innovation. I also discovered while filming my video that it is actually awesome that they have the measurements both above and below the raised lip that makes sure your paper is straight. Why is that awesome? Because I found that when I was trying to get my paper to a certain measurement (like say the 5 1/2” mark in the photo above) I used the lines on the inside of the lip to place my paper; but if I was trying to confirm how long my paper was or wanted at a glance reference of where my paper was placed, seeing the full ruler with numbers outside/above the lip made it super quick to tell where I was at. **I miss the key measurements written on the middle of the trimmer. Like how it would show you where 8 1/2” and 6” was in the middle of the trimmer surface. I didn’t realize how much I used them to verify which side of my cardstock was the 8 1/2” side vs the 11” side that I had been cutting strips off of. I know there is the ruler on the blade track, but it was easier with it written on the surface. We’ll see how much I miss it overtime. **However, I LOVE the grid lines! I thought the grid lines were pretty and all but it wasn’t until I started cutting that I realized how handy they would be. Have you ever been cutting a piece of paper and found yourself thinking “I swear this paper is straight and flush against the raised edge of the trimmer, but is it really straight?”. I found with multiple trimmers that I could have something that I thought was straight but one end could be up to 1/4” off from where I thought I was cutting on the other side. So I love the grid lines because I can be sure that my paper is straight. 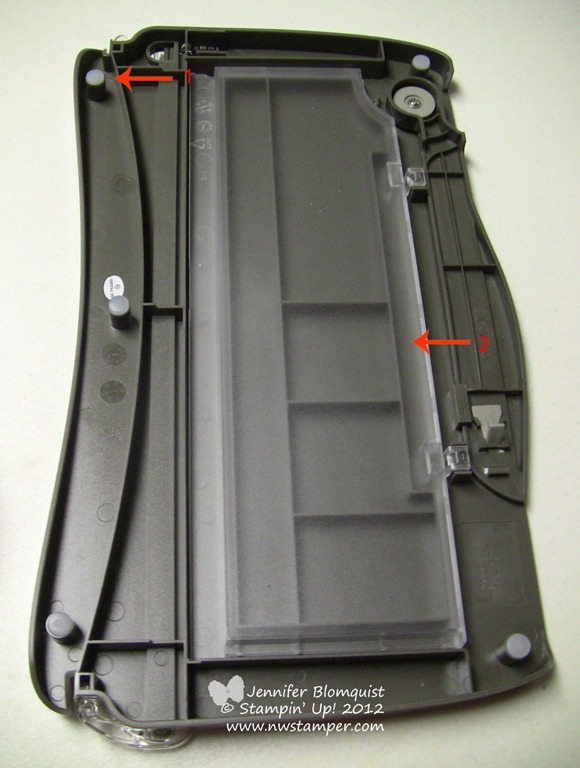 And, at least when your trimmer is new, the surface has some “cling” (not a residue cling, more like a static or surface tension cling) that helps hold the paper in place as well. So, I didn’t give the extender arm much though, but once I was told about the differences between this trimmer and my old trimmer, I think I’m going to come to appreciate them more that I expected. The arm is pretty stiff when you try to pull it out. I’m just warning you now. I tried to pull it out and I thought it was stuck for a few minutes. Nope, you just have to really want to extend that arm. 🙂 It seems like it is getting a bit easier the more I use it, but that could just be me getting used to how much I have to pull. It is also very stiff to get fully extended so that it is perpendicular to your trimmer base. Again, I thought maybe mine was broken, but after deciding to just go for it… I pushed hard and it snapped into place. Similarly, it is very stiff to pull the arm back in. But just commit to it and I think it gets easier over time. That said, the extended arm is very sturdy. 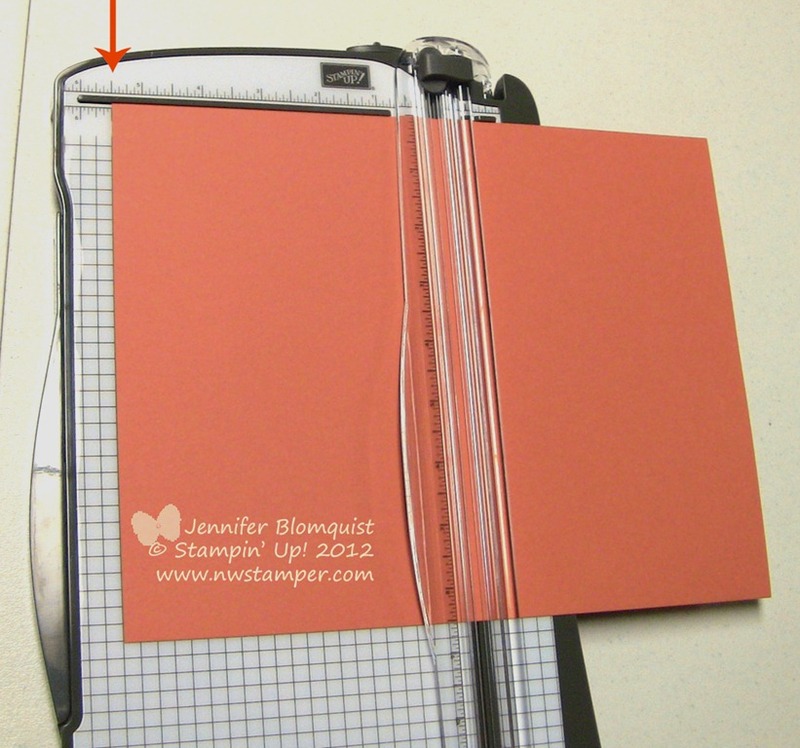 And it is the same height as the base of the trimmer; so you don’t have to worry about the fact that your paper is sagging like you did with the older trimmers. Oh, and there is a little plastic leg that flips down to keep it sturdy and holding the arm in place. Kind of neat. 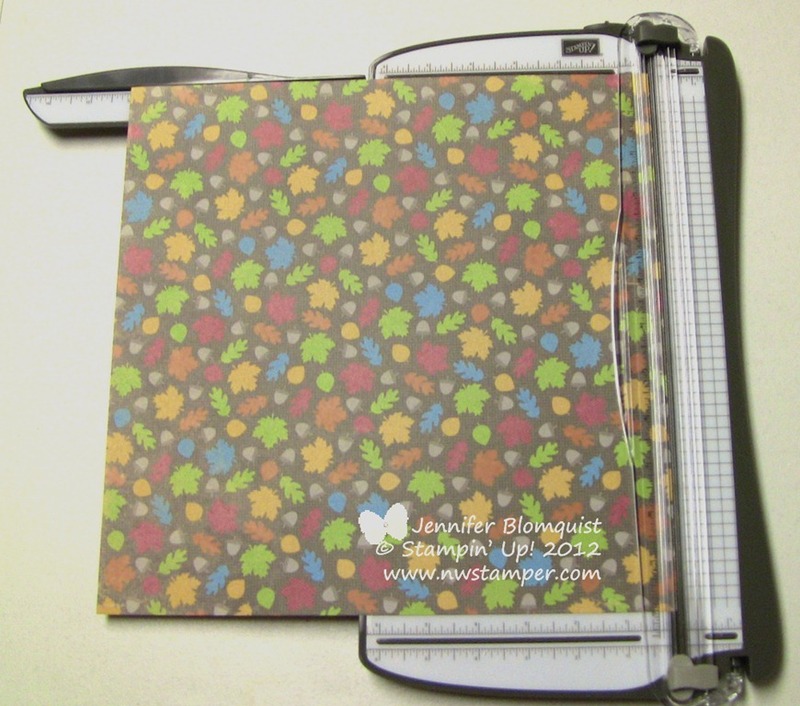 It also extends out to a full 14 1/2”, so you have lots of space for scoring larger projects or cutting larger pieces of cardstock. 2. A HUGE storage compartment!! 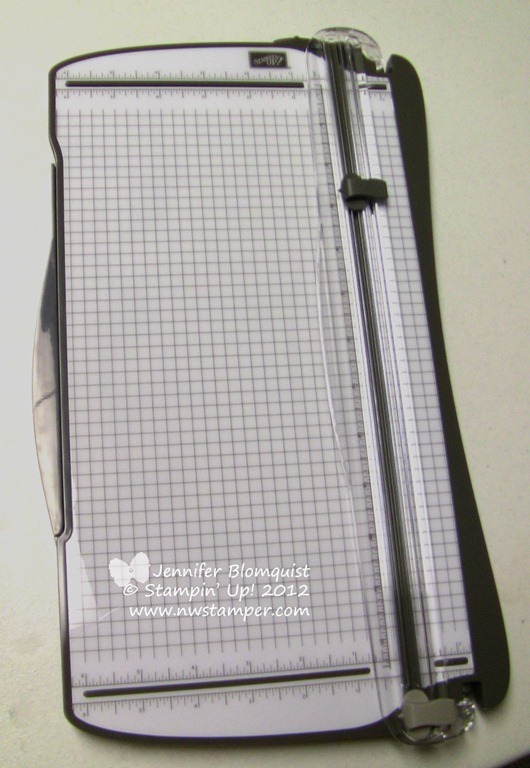 And it not only has a clear cover so you can see what you are storing, but it also has dividers so you can put a whole bunch of back up supplies in there and take them with you to a class/crop/retreat and be organized and easy to grab. I would store extra blades, adhesive refills, and tools like tweezers and bone folders for when I was traveling. The ruler/track is totally clear! Makes it way easier to see where my paper is actually lining up. The track has a switch that locks it in place (down) on the trimmer! Again, no more track flying open when you pick up your trimmer or pull it out of your craft tote. You can fit BOTH the scoring and cutting blade on the trimmer AND have a piece of 12×12 paper without worrying about your paper getting cut. Yay! So much easier to have the blades ready to go but still out of the way. 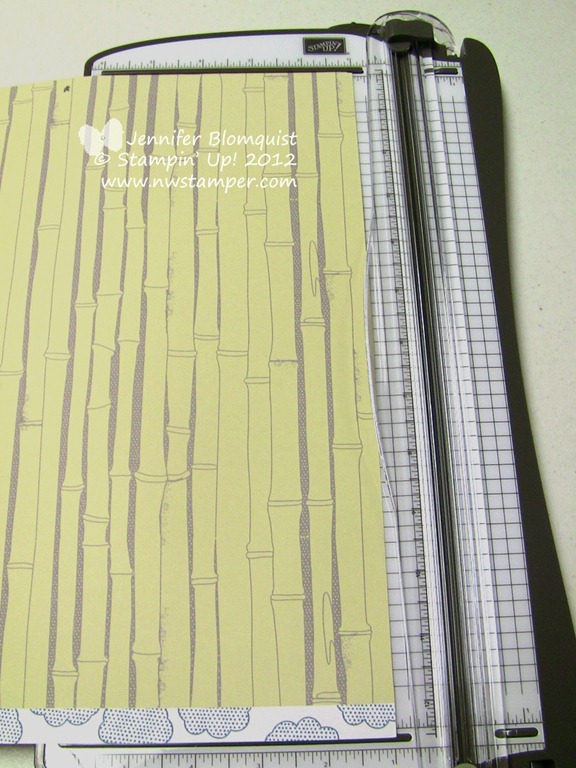 I was asked about whether a piece of 12×12 patterned paper that had an extra trim strip (usually for manufacturer information or the name of the paper pattern) – and thus being longer than 12” on one side” – would fit in the trimmer so you could cut off strips without needing to cut the trim…The answer is sort-of. See, I tried it with a piece of paper I had at home and found that the bottom lip of the trimmer is just a smidge too close for the paper to lie flat on the trimmer. 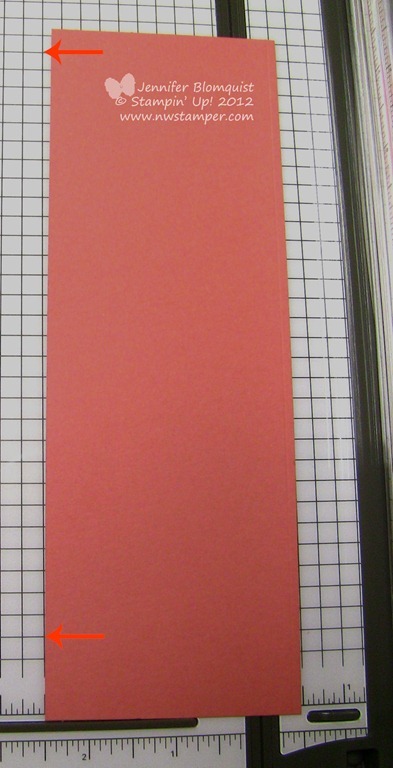 But the nice thing is that the track is so long that the blades sit well below where your paper ends and so you can easily slide your paper flush against the lip at the top of the page and then slide the cutter all the way down and past the end of the paper and edge strip. 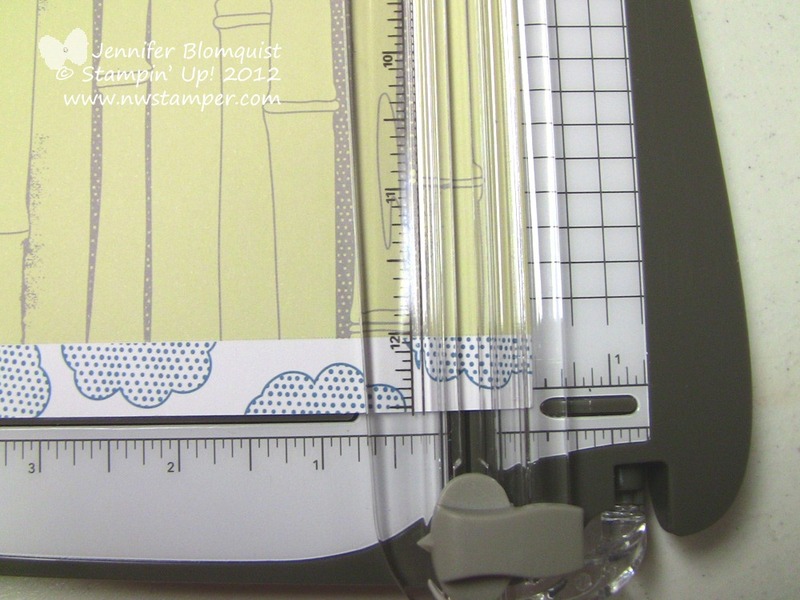 But one nice thing is that the clear track/ruler doesn’t press longer paper onto the raised lip. If you had the old Fiskars style trimmer (like the old SU trimmer with the orange blades) you may have run into this before where a paper that was longer than 12 inches would get bent when you tried to cut part of it because the track compressed the paper flush to the surface of the trimmer and then the paper bent up over the bottom edge of the trimmer. This is WAAAY better! Finally, I like that you get both a scoring blade and a cutting blade with the trimmer by default. If you are looking at the pictures: Gray is for scoring, Black is for trimming. And they both sit easily stored at the end of the track.I tried both blades and discovered that they had a learning curve. The cutting blade requires more pressure than you probably would expect. If you watch the video when I post it, you will see it took me 3 tries to cut a strip of cardstock on one slide along the track. The first attempt, I was too impressed with how smooth it glided along the track that I didn’t put much pressure on. The second attempt I added more pressure, but it wasn’t enough. By attempt 3, I had it figured out and it cut great for me ever since. The scoring blade works well, but I prefer my Simply Scored or other scoring boards for scoring card bases. I could probably add more pressure to the scoring blade to get a better impression; but I found that while it scored straight and easily, it wasn’t as deep of a groove (and thus as easy to fold) as when I use my Simply Scored. I will, however, like this blade for when I’m doing techniques like Faux Tiling or scoring lines on my card for decoration. Alright, so that is a lot of info and I think I covered most of it. And at the end of my brief evening playing with my new toy, I am still super excited about it and think even with its less than perfect aspects, it is still a big step forward over what I had before and I think it is going to be just what I wanted! I’m sure I missed something with this review and so I’ll try to get the video edited together today so I can get it posted for you soon. Then you can see some of these features in action! But in the meantime, if you have any questions about the trimmer, how it works, or its features – leave me a comment or shoot me an email at jennifer@nwstamper.com and I’d be glad to answer them for you! If you are a demonstrator (or sign up to become a demonstrator), you can order your trimmer now. 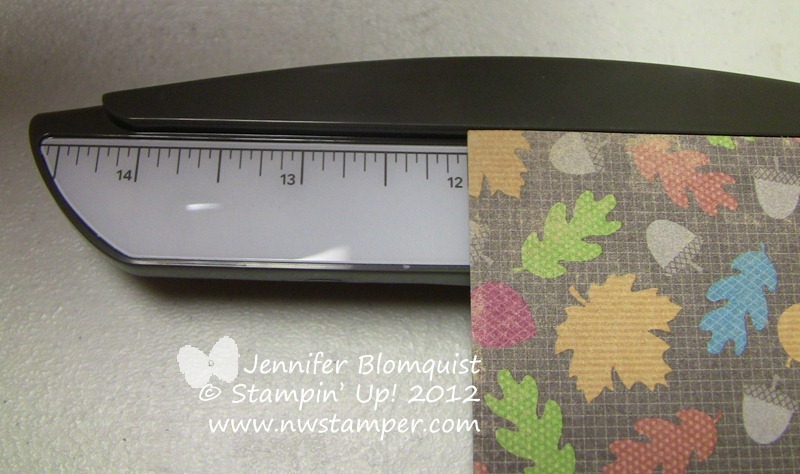 So please check back soon for the video and I hopefully will give you a better feel for the new Stampin’ Trimmer! Keep up the terrific works guys I’ve included you gyys to our blogroll.